AttituDe of GratituDe – Page 2 – Cut the B.S.! … I mean Blood Sugar! 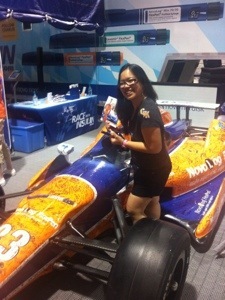 My second most memorable Long Beach Gran Prix! I just had the most amazing weekend! 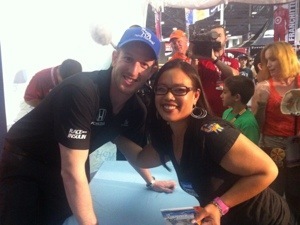 So, I’ve become quite the Indycar fan by association. 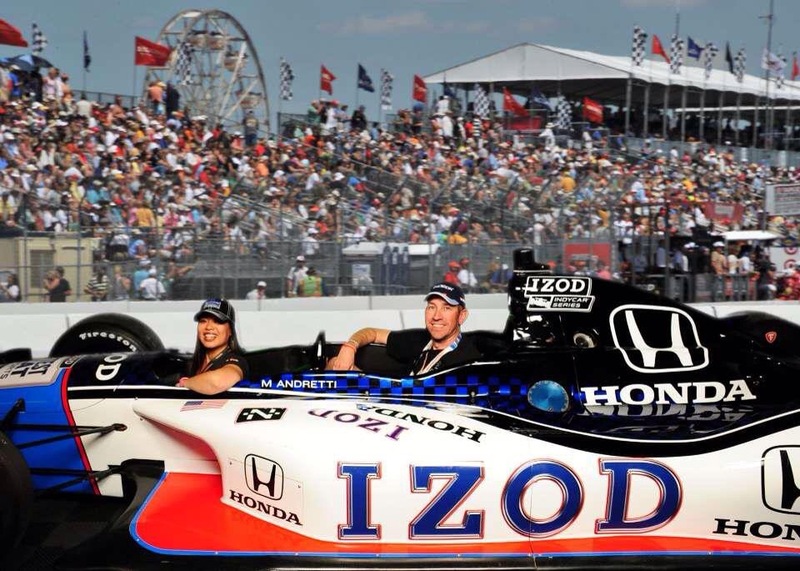 My husband was a huge fan when we met and he started going to the Long Beach Gran Prix 2000. I started going shortly after in 2003. Needless to say, I was very excited as it was my first race I attended since my diagnosis on June 28, 2012. Going as a newly diagnosed T1D, you know I was there as a huge Charlie Kimball fan. I was a fan of his before my diagnosis, but now it’s personal. 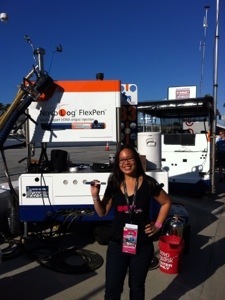 On Friday, we walked the pits, and I found Charlie Kimball’s pit box…so I had to get a picture while sporting my Super Duper Handy Dandy Novolog FlexPen! 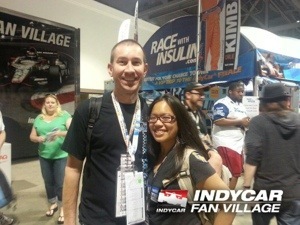 On Saturday, We went to the Indycar fan village where the Race with Insulin tent was up. There, I got to sign up for a chance to win a VIP trip for four to the final race of the year in Fontana, CA. After entering, I was able to sign this shell of Charlie’s car. I love this guy. I’m so happy, Ryan introduced me to this sport. As I was there talking to the Novo Nordisk people, I told them that I was gonna come back for the Question and Answer Session with Charlie and have him sign my Novolog Flexpen. They told me that there would be a special line for Novolog Users and to see their marketing person to make sure I was in the right line! Oh boy! Oh boy! 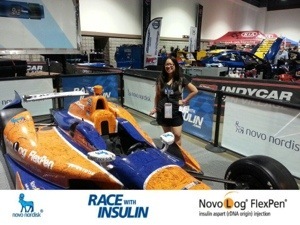 I was the only adult in the special VIP (Very Insulin-dependent Person) line that day! I got to tell him my story of the fact that I had been diagnosed last year and that when they told me I had diabetes, I hoped I was prescribed Novolog so I can support Charlie even more! The weekend I came home from the hospital after being diagnosed, Charlie drove to his first podium finish in Toronto. He placed second. I like to think he did for me. I had to make sure I took another picture after getting my Charlie swag! As always, it was a gret race day. What made this one even better was at the end of the day, Ryan and I were able to sail away into the sunset with a great friend. …And then this happened…about a month later! I thought they skipped my part since they showed Charlie with all the kids that day but, nope, check for this Cut the BS Girl’s story at 13:14! Some of you may be wondering what my most memorable Long Beach Gran Prix is. It was in 2003 when I got engaged to the most amazing man after the race! I’ve been quite the fan ever since. The only two Long Beach Gran Prix I’ve missed are the years we welcomed our daughters into the world. Go figure: Friday came along, I blinked, and Diabetes Blog Week was over. I want to thank Karen Graffeo of www.bittersweetdiabetes.com for organizing this and bringing me back to blogging. It really is something that I enjoy and I hope those of you who read Cut the BS…I mean Blood Sugar can tell. Today’s post was supposed to be about food. I’ve posted about food before and I will post about food again so I decided to write about one of the wildcard topics. It asks me to personify my diabetes. As much as I’d like to call my Diabetes every horrible name in the book, I recall referring to myself as a D-Toddler at the Diabetes unConference in Las Vegas this year. The more I think about it the more I find that is a better personification of my Diabetes. For me, it’s like having an additional child. I’m a mother of two young women, both under the age of ten, and I find that in being a parent, my husband and I have to take the lead and make decisions for them. I can’t expect my diabetes to take care of itself. I have to keep a watchful eye on my diabetes, just like my girls. It is my responsiblity if my girls hurt themselves because I did not set boudaries or check in with them soon enough. It is my responsibility if one of my girls end up with her head between the stair railings or my blood sugars get too high and it is my responsibilty to get her head out of there or get my blood sugar back to a healthy range. Luckily, no one’s ever gotten her head stuck between the railings at our house. Similarly to having a child, having diabetes takes some getting used to. With time, I’ve gotten the hang of it and can roll with the punches. Diabetes has it’s routines just like babies and toddlers have their routines and by the time I get used to the routines, the children and the diabetes change on me and I have to adapt. There are fears and frustrations upon being a parent, but there are also little joys and victories like the first time all of us slept through the night or the times I make changes in my treatment and it happens to work. Both have resulted in funky victory dance. The difference is my children will eventually grow up and make decisions of thier own based on their experiences in life. My diabetes will always depend on me to make decisions to keep both of us in line. I know that there are devices and surgical procedures in the works that might make decisions for me in the future, but my body will never correct itself or appologize when we are not in agreement. My daughters and I have already corrected ourselvs and appologized to each other countless times in my tenure as a mother. Diabetes will always be a part of me just like my girls are, but I will probably never love my Diabetes and I doubt that I will ever be proud of my Diabetes. Needless to say, but I will, I very much love my girls and my husband and am very proud of every accomplishment they make along the way. 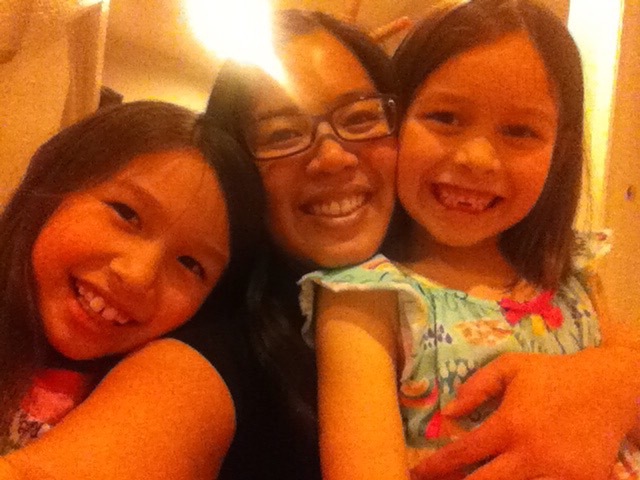 My relationship with my diabetes has evolved, just like my relationship with my girls. And through the years, it will continue to evolve. But some things will always remain: I will always be Mom and I will always be a Person with Diabetes. Diabetes Blog Week 2015 Day 4: Got any change??? I found myself running low on time today, but I seeing as I have recieved a surprising amount of feedback from friends, aquaintances, and people I don’t even know, I thought I’d keep the momentum going. I even began a post for other blogs that I work on that don’t have anything to do with Diabetes. Yay blogging! Anyhow, today’s subject is change. What would I most like to see change about diabetes? Hmmmm let’s see, besides its exsistence? I’m gonna go with yesterday’s theme…less pricks in my life, please! At my last appointment, my endo and I were talking and in her opinion, if checking blood sugars was not so uncomforatable, we’d do it more often. I agree. If you asked anyone to choose between checking their blood sugar or their blood pressure, I’m sure more people would pick a tight little hug in the arm than a poke in the finger. Anyone interested in checking their BS by using a Google Contact Lense? I know I am! For those of your who won’t be blogging this week, I’d still love to hear your thoughts on this, maybe in comments? 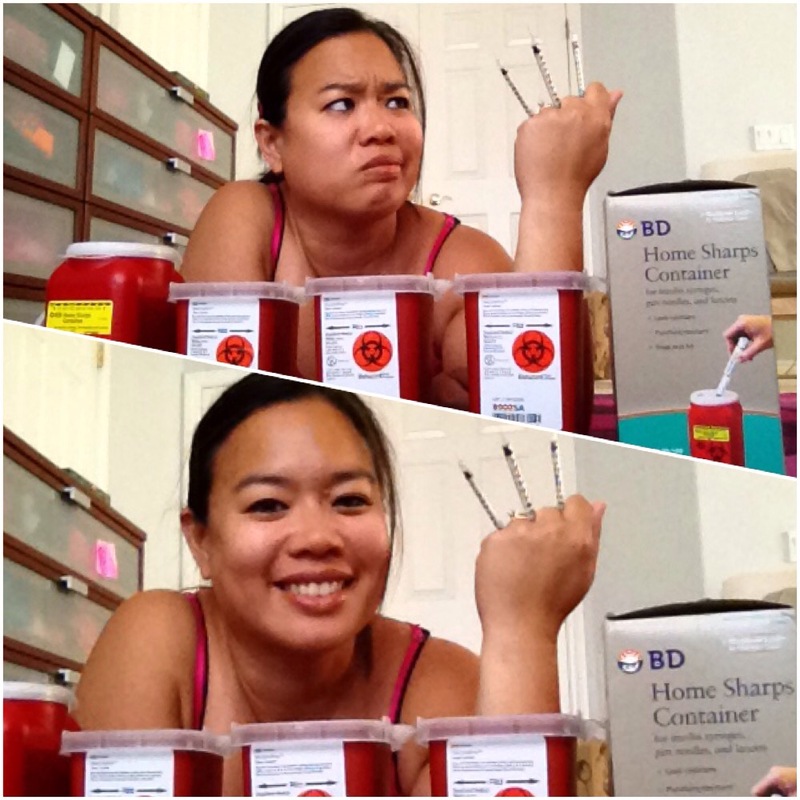 Diabetes Blog Week 2015 Day 3: Clean it Out, Girl! I’m trying to think of what I can clean out this week…I find myself a little emotionally raw from yesterday’s post so I’m gonna look for something that I physically hang on to. I can’t imagine finding something that I phycially hang on to as something that is gonna set me off. I decided to look at my supply shelf and realize that I am a sharps container hoarder. There I said it. I don’t know why this is. I must have like 5 of them and two on reserve still in the boxes they came in. None of them are full..well maybe one of them is full. I don’t know why I accumulate so many or feel the need to have multiple back up containers. Should I get rid of them? Absolutely, what’s the use in hanging on to these things, well except to collect lancets, syringes, and pen needles? Is it me or are these sharps containers like little plastic piggy banks for all my pokey devices? At least a piggy bank will buy me a beer when its full. The only thing a sharps container gives me when its full is the problem of disposing of it and the neccessity for a new one. Like my homage to being from the westside? I sit here in awe of the weekend I just had with you all, attendees, facilitators, and sponsors. I had no expecatations of the weekend but I cannot believe how much I learned from each of you. I actually went into this thing, thinking I didn’t belong there because I have only been a PWD for 2 years and 9 months. I was scared. I was afraid I was going to hear things like, “Oh, you’re so new. You can’t possibly need to go to an event like this.” I did not hear that once this weekend. You were open, candid, funny, frustrated, happy, angry, and most of all, genuine with me. You also created an atomosphere where I could be open with my own feelings of being a PWD. My heart is heavy…I can’t figure out if its because we all had to part ways yesterday and I’m sad, or if it is because my heart is overflowing with love, encouragment, and a sense of peace with how I’ve been living my D-life thus far. Diabetes doesn’t really have a “type” it likes to strike. We varied greatly in size, shape, color, gender, personality, food preferences, and fashion styles. One of the few things we had in common were our busted pancreases and that it wasn’t our fault no matter what anyone may say or think. Another thing was the sense of humor we have about this chronic condition were share. I’ve been burrying my thoughts and personal feeling on Diabetes deep down by filling my schedule with “stuff” and have just thrown on a happy face. I learned this weekend that it’s ok to be angry and frustrated about it, but to not let that anger and fustration consume me. I miss my Dexcom. IV3000 here I come! I learned that “My Diabetes May Vary.” (Bennet, where do I send my quarter?) My Diabetes reacts completely differently from someone else’s, so hearing and trying what works for someone else is totally worth a shot because it might just work! Or it won’t and that’s OK too. I don’t know much about Diabetes…but…Diabetes doesn’t know much about me, dammit. I declare war, Diabetes. I’m going to win as many battles as I can. I am optimistic, inspireD, and hopeful. With the support and knowledge I was gifted this weekend, I will make every effort never to let Diabetes bully me or anyone else for that matter. Because of you and others like us, I aspire to be a Dia-advocate, a Dia-nurturer, a Dia-cheerleader, a Dia-bestie, lastly and probably most importantly, a Dia-Badass. I pledge to make other People with Diabetes feel welcome, respected, and valued beyond the confines of the Red Rock Conference room. I hope you’ll join me. 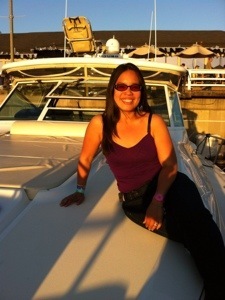 Thank you for sharing your experiences, sarcasm, tips, and personal style as a PWD with me. Most of all, I thank you for being you. It was more than I could ever have hoped or asked for (seeing as I seem to have a hard time asking for help). It’s hard but, I will try not to cry beacause it is over. (This Vegas dust is just getting to me.) Instead, I will smile, because it happened! To find out more about the Diabetes UnConference, Click Here. 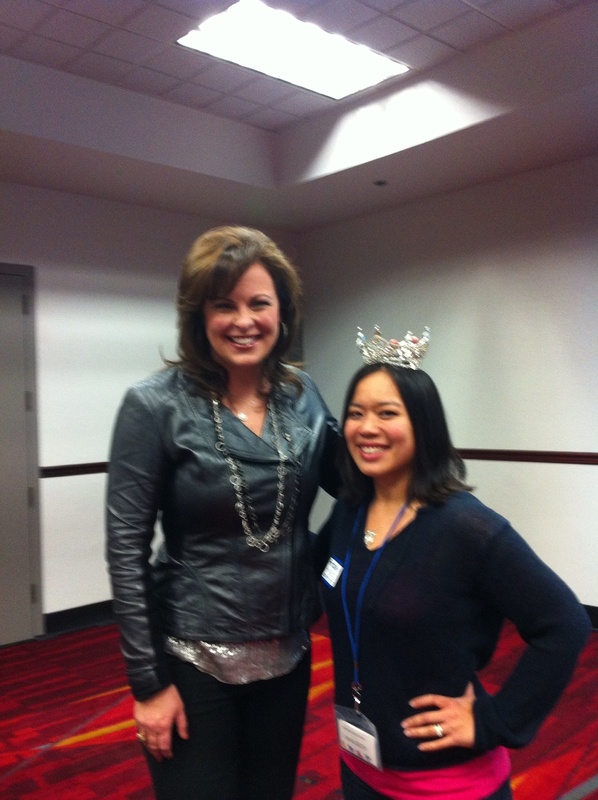 I jumped at the chance of wearing Miss America 1999-Nicole Johnson’s crown. I’m sorry it’s blurry, I had my Dad take the picture. He said that his hand was shaking when he took the picture. Maybe being around such a beautiful celebrity made him nervous, who knows, but bless his heart! Nicole Johnson, Miss America 1999 is a Type 1 Diabetic. She spoke at the symposium today and discussed some great topics like making sure to stay on the optimistic side of the street, the importance of building a strong support system for the days that Type 1 Diabetes gets us down, and coined a term for the loved ones who support and cheer on their Person with Diabetes (PWD). They are known as Type 3s. She also talked about her D-Day, the day she was diagnosed at the age of 19. She was urged to drop out of school, to move home with mom and dad, pick a calm and easy career (not journalism like she wanted), and to not even think about becoming a mother. Oh, and by the way, maybe pageant competition isn’t such a good idea. So, what has she been doing since that diagnosis day? A whole lot of, “Oh yea? Watch me!” She has since earned multiple college degrees including a PhD. Nicole did have a career in journalism and now she works as a spokesperson and motivational speaker-a carreer I wouldn’t call calm. She also enjoys being a mother to a healthy 8 year old girl. Oh, and did I mention, she was crowned Miss America in 1999! Knowing what my life has become and all the things I’ve been able to do in just the year and a half that I’ve been a Type 1 Diabetic, I find it silly what this woman was told. Its bad enough what ends our minds go to when we first get diagnosed without any outside influences. 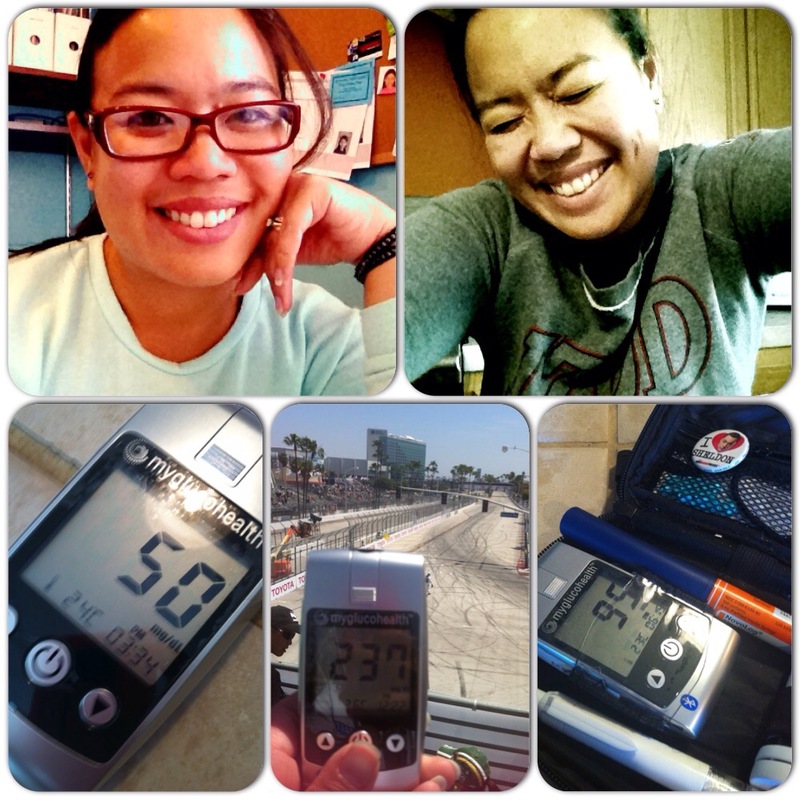 Total and utter B.S….and I don’t mean blood sugar this time. How grateful am I that I had the opportunity to hear this beautiful, brave, and strong woman speak. I hope to be like her when I grow up. Cut the B.S…I mean blood sugar! Have you ever been told you couldn’t, wouldn’t, shouldn’t do something that you found silly? What was it and how did you respond? Leave us a comment.